The concept of associative memory discussed in Chap. 3. When an incomplete set of data is given, the associative memory must be able to complement it. We construct a dynamical process by which pattern recognition is performed. To this end we invent a potential landscape in which a fictitious particle, which describes the patterns, moves. An example is provided by the ambivalent patterns of Fig. 5.1. Later on we shall see that ambiguous patterns require a specific treatment, but for the time being we shall stick to the idea that the system is pulled into one of its attracting states provided an initial condition is set such that the symmetry is broken. In other words, the pattern that is recognized first is the one for which a certain bias was given, or, expressed in yet another way, the pattern is recognized once it is within its basin of attraction. We treat the system as a synergetic system according to the following idea: In Chap. 4 we saw that a partially ordered system, e.g. a fluid in which some of the rolls have been formed, may generate its order parameter, which then competes with the other order parameters of the system. Because of the special preparation of the initial state involving partially ordered subsystems, the order parameter belonging to that specific order wins the competition and, eventually, enslaves the whole system such that it enters a particular ordered state. In pattern recognition we shall take advantage of the same mechanism. Once a set of features is given, they can form their order parameter which will compete with other order-parameters. Eventually the order parameter that had the strongest initial support will win, and will force the system to exhibit the features that were lacking with respect to the special pattern (Fig. 5.2). 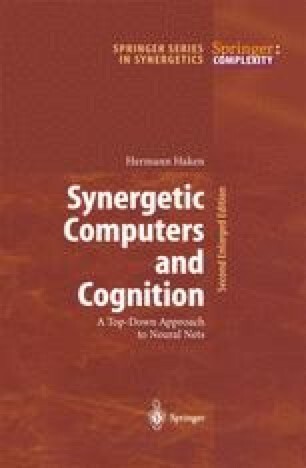 Thus we see that there is a complete correspondence between the complementation process during pattern formation and the associative memory during pattern recognition.